How does the app recognize returning visitors? Do you have visitors who regularly come to your office? We're sure you do! In our experience, most companies that engage with contractors or vendors tend to see the same individuals several times a month. It's Monday morning, and Johnny has a meeting with Paul at Alpha Company. When Johnny arrives, he uses The Receptionist for iPad to check-in. He finds Paul in the company directory as the person he's come to visit, then, Johnny enters his own email address, name, company, and phone number. Finally, Johnny reads and signs an NDA, and within a few seconds, Paul sends Johnny a message to the iPad to let him know that he's on his way. "Pretty neat" Johnny thinks to himself as waits for Paul arrive. Johnny and Paul have their meeting and determine they need to meet again on Wednesday. When scheduling the meeting, Johnny notices he was sent an email summarizing his visit to Alpha Company that contains a link to the NDA that he signed. Nice! On Wednesday morning when Johnny arrives, he once again uses the iPad to find Paul, but this time when he enters his email address, he's presented with a screen welcoming him back. He is presented the option to edit his info or simply check-in and he thinks to himself, "Wow, that was easy." Johnny touches check-in, meets with Paul, and has a great meeting. How can you enable Returning Visitors on your account? Turning on the Returning Visitor feature is really simple. 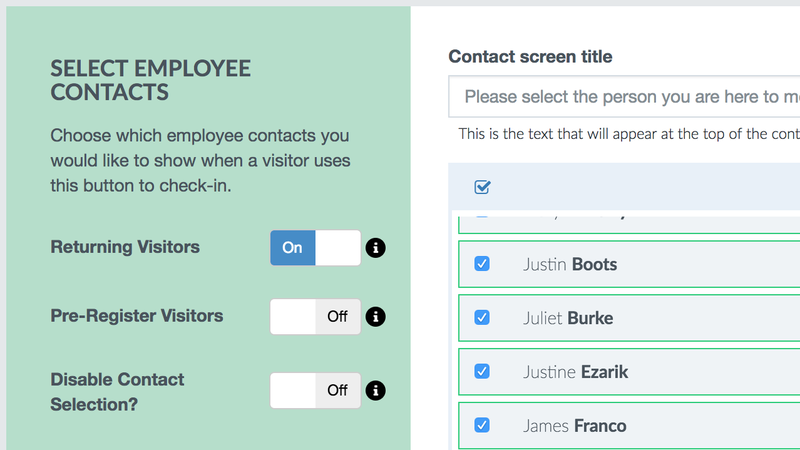 All you have to do is edit a check-in button, scroll down to the "Employee Contacts" section, enable the switch for Returning Visitors, and agree to having email address added as a visitor field. Do I need to collect the email address? Yes. Our Returning Visitor feature works by looking up the email address that a visitor enters, so the email address field needs to be the first field that is asked of your visitors. As long as you don't click the lock button associated with the email address field, your visitors will be able to skip inputting their email address if they would like. Why can't I move or remove the email address field? Since we lookup a visitors info using their email address, we require that it be the first question that appears for the visitor. If you would like to remove email address or move it, you will need to turn off the Returning Visitor feature.